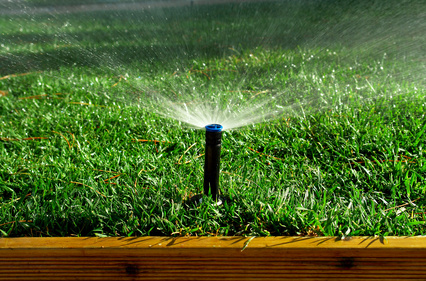 Watering your lawn can seem like a pretty basic responsibility, but there are things to remember when you go about doing it. A well-watered lawn can look healthier, have less risk for diseases and insects, and can grow more dense and green. When you are watering your lawn, follow these tips to ensure your lawn can be the best it possibly can. When you first plant your sod, it should have a steady dose of moisture at all times. For the first two weeks at least, your lawn should be constantly wet. Pay the closest attention to the edges, where the grass meets sidewalks, pathways, or walls, as these areas are the most likely to dry out and wear down. You will want to be very aware on hot or very windy days, as the weather can dry out the lawn very easily. The constant moisture will help the grass grow and set up strong roots in the soil. After the first two weeks and first mowing, your watering habits can vary a little bit more. You can probably get by with less frequent watering, but you will want to make sure the cycles last a bit longer. This allows for greater moisture retention and deeper infiltration, meaning the grass will dig roots in deeper and less water will evaporate over time. A good rule to follow is that grass needs about one inch of water per week during the spring and summer months, either from watering cycles or rain. You may require more depending on soil quality and weather conditions, like heavy sun exposure or wind. The best time of day to water your lawn is in the morning, whether it be early morning or late. This allows for softer soil and gives you less chance of runoff. If your soil conditions do not allow for one inch of water at a time without runoff, spread the watering out over a two or three day period, doing half an inch one day and the other half the next. 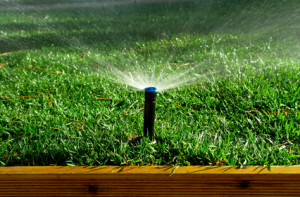 If you want the healthiest grass you can get, avoid watering in the afternoon or evening when the heat gets the worst. This will cause most of the moisture to evaporate, leaving your lawn with far less water overall. With less water, your lawn will not be as healthy and may be left open for more diseases and other issues.